All LED technology makes the new insert energy efficient , more realistic flame effect and very attractive with a lifespan of up to 100,000 hours. The 1,350 Watt Fan Forced Heater which will produce 4500 BTU, supplying enough heat to heat a an average sized room of 400sq ft room. Economical to operate* and a breeze to set up – no renovations required! 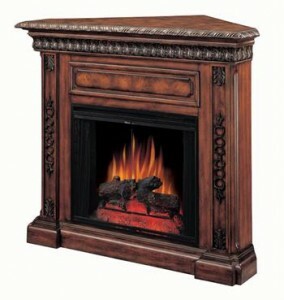 Free standing wall mantel can be placed at any corner. Regular 110v electrical outlet needed.